Alberta Hunter (April 1, 1895 – October 17, 1984) was an American jazz singer and songwriter who had a successful career from the early 1920s to the late 1950s, and then stopped performing. After twenty years of working as a nurse, in 1977 Hunter successfully resumed her popular singing career until her death. In 1919, Hunter married Willard Saxby Townsend, a former soldier who later became a labor leader for baggage handlers via the International Brotherhood of Red Caps, was short-lived. They separated within months, as Hunter did not want to quit her career. They were divorced in 1923. Hunter was a lesbian but kept her sexuality relatively private. 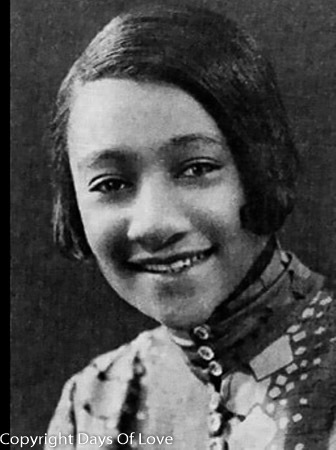 In August 1927, she sailed for France, accompanied by Lottie Tyler, the niece of the well-known comedian Bert Williams. Hunter and Tyler had met in Chicago a few years earlier. Their relationship lasted until Tyler's death, many years later. Hunter is buried in the Ferncliff Cemetery and Mausoleum in Hartsdale, Westchester County, New York (Elmwood section, plot 1411), the location of many celebrity graves. Hunter's life was documented in Alberta Hunter: My Castle's Rockin' (1988 TV movie), a documentary written by Chris Albertson and narrated by the pianist Billy Taylor, and in Cookin' at the Cookery, a biographical musical by Marion J. Caffey, which has toured the United States in recent years with Ernestine Jackson as Hunter. Hunter was inducted to the Blues Hall of Fame in 2011 and the Memphis Music Hall of Fame in 2015. Hunter's comeback album, Amtrak Blues, was honored by the Blues Hall of Fame in 2009. "Alberta Hunter – United States Social Security Death Index". FamilySearch. Retrieved 30 May 2015. Lewis, Uncle Dave (17 October 1984). "Alberta Hunter: Biography". AllMusic.com. Retrieved June 13, 2014. Wilson, John S. (October 19, 1984). "Alberta Hunter, 89, Cabaret Star, Dies". New York Times. Retrieved July 7, 2015. "Alberta Hunter". Notable Nurses. Retrieved July 7, 2015. Balliett, Whitney (October 31, 1977). "Let It Be Classy". The New Yorker. Retrieved July 7, 2015. "United States Census, 1910". FamilySearch.com. Retrieved 30 May 2015. Goldman, Stuart A; Albertson, Chris; Taylor, Billy; Hunter, Alberta; Churchill, Jack; Cohen, Robert M.; Alfier, Mary (2001). Alberta Hunter: My Castle's Rockin' (deluxe ed.). New York: View Video. ISBN 978-0-803-02331-4. OCLC 49503904. Retrieved July 11, 2015. Gates, Henry; et al. (2009). Harlem Renaissance Lives. Oxford University Press. ISBN 978-0-19-538795-7. "Alberta Hunter". Encyclopædia Britannica. Britannica.com. October 21, 2014. Retrieved July 7, 2015. "Alberta Hunter (1895–1984)". The Red Hot Jazz Archive: A History of Jazz Before 1930. Redhotjazz.com. Retrieved July 7, 2015. Gates, Henry; et al. (2009). Harlem Renaissance Lives. New York: Oxford University Press. p. 277. ISBN 978-0-19-538795-7. Larkin, Colin (2004). The Virgin Encyclopedia of Jazz (rev. updated ed.). London: Virgin in association with Muze UK. p. 431. ISBN 978-1-852-27183-1. OCLC 859068143. Barlow, William (1989). Looking Up at Down: The Emergence of Blues Culture. Philadelphia: Temple University Press. pp. 134–135. ISBN 978-0-877-22583-6. OCLC 17981033. "After 20 Years of Silence, Alberta Hunter Sings 'Remember My Name'—and Memphis Gives Her the Key to the City". People (Vol. 10, No. 20). November 13, 1978. Retrieved July 7, 2015. Russell, Tony (1997). The Blues: From Robert Johnson to Robert Cray. Dubai: Carlton Books. p. 12. ISBN 1-85868-255-X. Gates, Henry; et al. (2009). Harlem Renaissance Lives. New York: Oxford University Press. p. 278. ISBN 978-0-19-538795-7. Russell, Tony (1996). The Blues: From Robert Johnson to Robert Cray. Dubai: Carlton Books. pp. 120–21. ISBN 978-1-858-68255-6. OCLC 222232351. Treaster, Joseph B. (September 1978). "Belting Out the Blues at 83". Quest/78. pp. 23–28. Smith, Jessie Carney (1992). Notable Black American Women. Detroit, Michigan: Gale Research. p. 528. ISBN 0-8103-4749-0. "Remembering Charles Bourgeois: An Arbiter of Good Taste in Music, Cuisine, Fashion and People: Long-time Festival Public Relations Director". Harlem One Stop News. February 18, 2014. Retrieved July 7, 2015. "Willard Saxby Townsend". United States World War I Draft Registration Cards. Familysearch.org. Retrieved July 8, 2015. "History". Despres, Schwartz and Geoghegan. Retrieved July 7, 2015. "Williard Townsend". National Railroad Hall of Fame. Retrieved July 7, 2015. Melancon, Trimiko; Braxton, Joanne M (2015). Black Female Sexualities. New Brunswick, New Jersey, and London: Rutgers University Press. ISBN 978-0-813-57174-4. OCLC 878111531. Retrieved July 7, 2015. Marks, Carole; Edkins, Diana (1999). The Power of Pride: Stylemakers and Rulebreakers of the Harlem Renaissance. New York: Crown. ISBN 978-0-609-60096-2. OCLC 39875089. "Alberta Hunter (1895-1984) - Find A Grave..." www.findagrave.com. Retrieved 2017-11-16. Wilson, Scott. Resting Places: The Burial Sites of More Than 14,000 Famous Persons, 3d ed. McFarland & Company. Kindle edition (locations 22700–22701). "Celebrities & Notables Interred at Ferncliff". FerncliffCemetery.com. Retrieved July 7, 2015. "2011 Blues Hall of Fame Inductees: Performers: Alberta Hunter". Blues Hall of Fame. 2011. Retrieved July 7, 2015. "2009 Blues Hall of Fame Inductees: Classic of Blues Recording: Album: Amtrak Blues (Columbia, 1978), Alberta Hunter". Blues Hall of Fame. 2009. Archived from the original on September 23, 2015. Retrieved July 7, 2015. "Alberta Hunter: My Castle's Rockin'". View Video. Retrieved June 13, 2014.